"The job of reading any Elvis related memoir is the literary equivalent of Groundhog Day" I remember reading somewhere. This is also true when it comes to Sonny West's Elvis: Still Taking Care Of Business that I bought recently. Published in 2007, it's kind of a sequel to Elvis: What happened? and while detailed enough, offers no surprises or new revelations. Coincidently, it was released the same year as Me And A Guy Named Elvis, written by another long serving member of the Memphis Mafia, Jerry Shilling. But while Shilling tends to be maybe a little bit too diplomatic at times, especially when it comes to Elvis downfall, the same can't be said about West's account. He doesn't dodge Elvis misuse of prescription medicines and his "self-destruct course" during the last couple of years. You can't accuse Sonny West of being a diplomat, either. He shares his opinions about people freely, and it's no surprise his book isn't among the ones sold at Graceland. Priscilla and Lisa Marie are not among Sonny West's favorite people, and that's something he lets his readers know in no uncertain terms. In a way I find his honesty refreshing, although sometimes it becomes a bit bitchy. The book is also very talkative, and that can be wary at times. 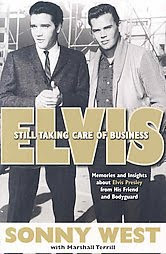 In the end it's Sonny West's own stories and Elvis tidbits that makes Elvis: Still Taking Care Of Business worth reading. Elvis getting inducted into the Tau Kappa Epsilon fraternity at Arkansas State University is one example, Elvis not being able to open the gate for a cab another. Sonny West ends the book by saying that not a day goes by without something said, heard or seen that makes him think of Elvis. In that way he's not any different than most fans, me included. But he "had a front-row seat on the roller-coaster ride that was the last two decades of Elvis Presley's life." That's why I read his book. Maybe a new book by his cousin Red would be more interesting?